Michael Vickerman, RENEW Wisconsin; and Nancy Collins. Ben and Nancy Collins weren’t only thinking about energy savings when they installed a solar hot water system at their Platteville residence to serve their family of six. 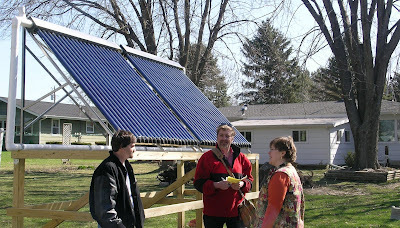 They also wanted to influence their children’s attitudes toward renewable energy use. But there are aspects of the Collins’ solar hot water system that are decidedly not normal. For example, due to heavy shading from nearby trees, the solar collectors could not be placed on the rooftop of the Collins’ home. Instead, the installer, Todd Timmerman of Timmerman’s Talents, Platteville, went searching for the least-shaded section of their yard, which turned out to be their garden. But such is the Collins’ commitment to harvesting solar energy that they decided to move the garden, and situate the collectors in its place, amidst the cilantro, basil and strawberries. On that space now stands a four-foot-tall wooden structure, housing two collector panels facing the sun at a 45º angle. Since its completion in September 2007, the ground-mounted system has become a neighborhood fixture, a few feet from where neighborhood children congregate and play in the Collins’ yard. The array installed by Timmerman captures radiant solar energy through a series of vacuum-sealed tubes (also called evacuated tubes). Inside each tube is a copper heat pipe. Sunlight striking each of the 40 tubes heats a liquid inside each heat pipe, which quickly turns into a vapor. The gas travels upwards and releases heat into a larger pipe running along the top of the array. At that point the heat is transferred to a glycol solution that is then pumped into the house to where it heats the water inside.